THEIR SEVENTH ALBUM "PROFAN" IS OUT NOW - WINNER OF "BEST METAL ALBUM OF 2015" AT THE NORWEGIAN GRAMMYS (SPELLEMANN)! 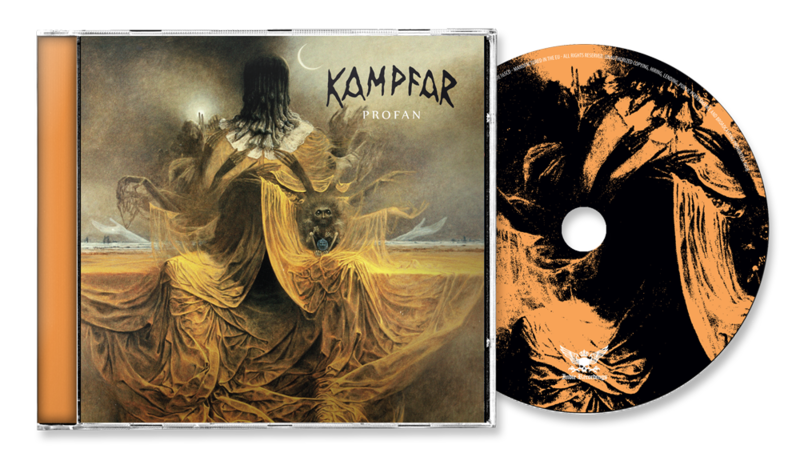 "When it comes right down to it, I can think of no better standard bearers for the true spirit of Norwegian Black Metal than these four mighty warriors…"
Kampfar presents the fiercest and most intense recording of their career. Since its first conception in 1994 with folk and classical music influences, via the colder winds on Kvass, the band has kept on renewing, and elevated into the black metal authority that reaches its peak on “Profan”. Songs like “Pole In The Ground” and “Profanum” hearken back to the vibes of the early 90s black metal while keeping the edge of 2015 Kampfar, while slow burners like “Daimon” and epic album closer “Tornekratt” shows that Kampfar can go deep down and still deliver such intensity that few in the world of metal can match. 2011's “Mare” represented a journey into the world of witches of the past and the present, and was followed in 2014 by “Djevelmakt” and its conceptual journey into the underworld with rats, black souls and false choirs. New album “Profan” now finishes the thought process by digging so deep that there is nothing more there. There is only more digging to be done, and it is all fruitless. There is no more hope beyond the night terrors, no company beyond the snakes, nothing to be found but suffocating emptiness. The new album is the result of a creative wave that really took on gigantic proportions after the release of “Djevelmakt” in early 2014. Again, written partially in Bergen where half the band is located, and in the band's spiritual home in Hemsedal, the writing process was yet again highly gratifying. Jonas Kjellgren of world renowned Abyss/Blacklodge Studios was also involved again, as the drums on this album have the distinction and honor of being the last recording ever to be recorded through the mixing desk that has been the catalyst for so many legendary albums since the mid-90s. Vocals were recorded in Oslo's Waterfall studio with the aid of Stamos Koliousis, while all remaining recordings were handled by the band’s own Ole Hartvigsen, who also held the production reins. The mix was done by Jonas Kjellgren, seeing as he had grown to understand the band’s sound as well as they themselves did, and the result is a giant of an album. For the first time in the band's career, they have also chosen to record a video to one of their songs. Cooperating with Red Pig Productions due to their intimate knowledge of Beksiński's visual expression and their expertise in capturing interesting metal videos, the result is a story that more deeply explains the themes the album is founded upon. “Profan” is a fitting end to a long journey through nature's magic, the power of perseverance in the face of gargantuan forces, and finally acceptance that there is no such thing as resolution. But there will be fire.